Cook Time : 1 hour if kamut berries are cooked the night before. 2 hours, 15 minutes if the entire dish is cooked simultaneously. This is one of my favorite vegan recipes. It’s super easy to make, and I can set the table and prepare the rest of the meal while the kamut is cooking. Also, if pressed for time, it’s possible to make this dish a day in advance and heat up right before company comes. Just wait to garnish with the fresh herbs until serving. If you’re following the Ornish diet or another fat-free diet, just omit the oil from this recipe. Bon appetit! Note: Kamut is an ancient grain with a rich, nutty flavor. If you can’t find it at a store near you, you can buy kamut online, or substitute spelt or wheat berries. Note: the kamut will take almost 2 hours to cook. You may want to prepare the kamut the night before and store in the refrigerator until you are ready to make the rest of the dish. 1. Rinse the kamut berries under cold running water for several minutes. Place the kamut berries in a medium saucepan. Add 6 cups of water and the dried porcini mushroons. Salt the water generously. Cook over medium heat and bring to a boil. Then reduce heat and simmer until tender. It will take about 2 hours until the kamut is tender. Add water as necessary throughout the cooking process. The porcini mushrooms will create a nice “gravy” in the pot. Make sure the kamut does not dry out. 2. Preheat oven to 400 degrees and prepare the squash. Lightly coat the the cubed squash with 2 tablespoons of olive oil and place on baking sheet. Season with salt and pepper and bake for 30 minutes. 3. Coat a large saucepan with 4 tablespoons olive oil and heat over a medium flame. Once the oil is heated, add the chopped onions and shallots and season with salt and pepper. Cook for about 15 minutes, stirring occasionally, until soft and golden. 4. Add the mustard seeds, curry powder and cumin, stirring well, and continue cooking for about 1 minute or until fragrant. Add the vinegar. Stir well to deglaze, reduce the heat to low, and cook 2 minutes more. Remove from heat. Add the cooked kamut berries and all the remaining porcini mushroom liquid. Stir well. 5. Transfer the kamut berries and mushroom sauce to a large bowl. Add the butternut squash and toss to combine. Season with salt and pepper. Just before serving, garnish with the minced parsley leaves. May be served hot or at room temperature. Let us know what you think of this easy vegan recipe: Kamut Berries with Porcini Mushrooms and Butternut Squash! For a different twist on a favorite recipe, try adding 1/4 cup of lemon juice when you’re adding the cooked kamut/ porcini gravy to the tempered oil. If it’s too acidic for your taste, just add a bit more olive oil. Just made this again today! This year, I left out the shallots and onion, (I’m trying to avoid them), and it was still delicious! I loved this dish. 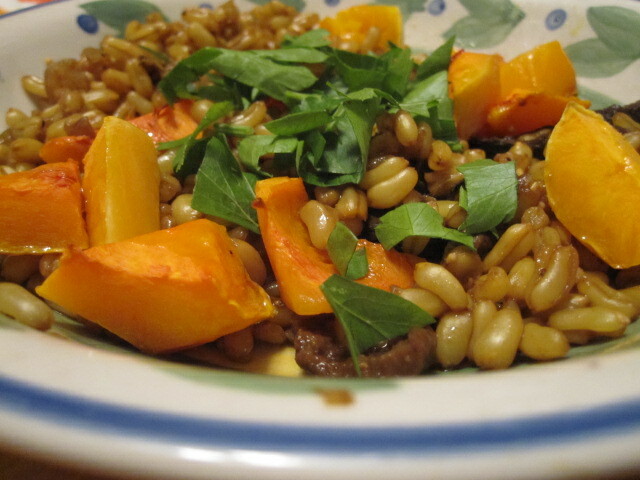 I couldn’t find Kamut Berries and ended up substituting Farro. I loved it, but not so sure about my husband. The best part is that are oodles of leftovers and I will be attending some social events that this will come in handy for. I’ve never heard of Kamut Berries. Does anyone know if they’re available in Australia and, if so, where they can be purchased in Melbourne?